The lorry was towed away on Thursday from the lay-by where it was found. Austrian officials now say more than 70 bodies, thought to be migrants, were in an abandoned lorry found on a motorway. They originally estimated that between 20 to 50 people died in the vehicle, found near the Hungarian border. Police discovered the decomposing bodies on Thursday morning after being sent to investigate the dumped lorry on the A4 motorway heading towards Vienna. The local police chief said it appeared those in the vehicle had been dead for one and a half to two days. The victims were probably already dead when the vehicle crossed into Austria from Hungary, authorities said. The vehicle was towed to a customs building with refrigeration facilities in Nickelsdorf on Thursday. Forensic teams worked through the night to examine the bodies. Austrian police are expected to reveal the exact toll at a news conference at 11:00 (09:00 GMT) on Friday. The Austrian and Hungarian police are working together to try and find the driver. The vehicle bears the logo of a Slovakian poultry company, Hyza, which said it no longer owned the vehicle – but the buyers had not removed the branding. 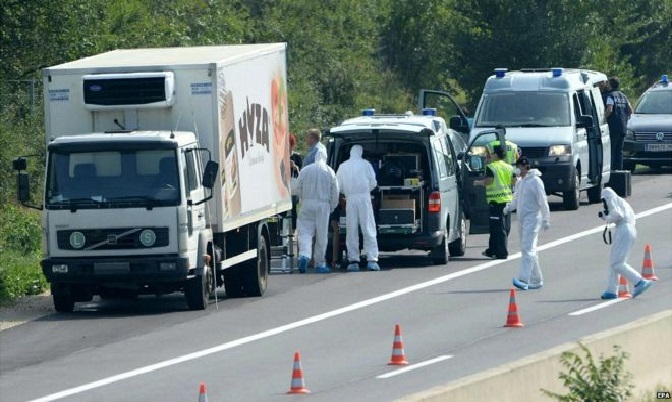 Hans Peter Doskozil, police chief in the Burgenland province where the lorry was found, said it was a refrigerated vehicle – not the typical choice for people smugglers, he added. The lorry, which has Hungarian number plates, is understood to have left Budapest on Wednesday morning. Tens of thousands of migrants from conflict-hit states in the Middle East and Africa have been trying to make their way to Europe in recent months. 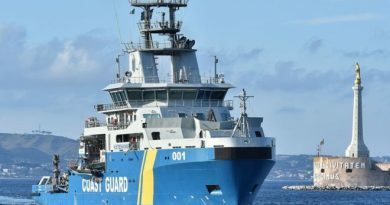 Some of them pay large sums of money to people smugglers to get them through borders illegally. German Chancellor Angela Merkel, in Austria for a summit with Balkan leaders on the migrant crisis, said she was “shaken” by the “horrible” news. “This is a warning to us to tackle this migrants issue quickly and in a European spirit, which means in a spirit of solidarity, and to find solutions,” Mrs Merkel said.